Anyhoo, just wanted to share with you my friends' wedding! They have a MunkyBizniz theme for it hahaha. They're pretty silly. 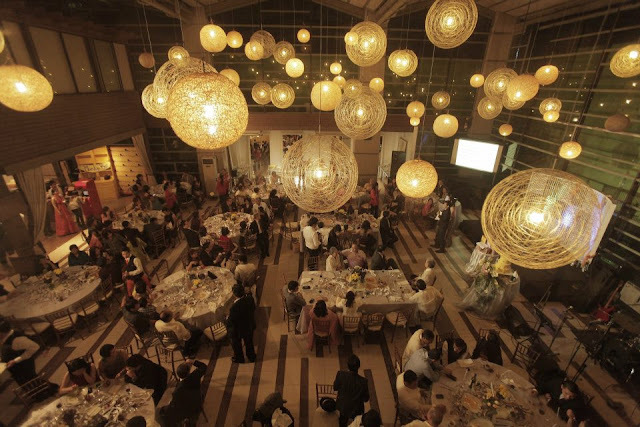 Before going into the nitty gritty of the wedding details, Mark and I had to come up with a concept for the wedding. As we are both creatives (he’s a self-employed sound engineer/director and musician; I’m a self-employed copywriter/Account Manager for below-the-line advertising campaigns), we didn’t just want to come up with a theme that was comprised of color combinations. Taking off from famous couple monikers like Brangelina and Bennifer, Mark thought of “Munky” (Mark+Punky). 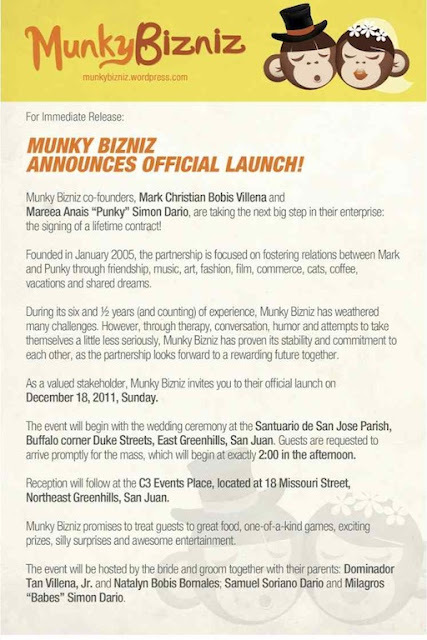 Next, coming from the insight that weddings are essentially launches of the new brand that is you and your husband, we thought of a brand launch concept to unveil the Munky brand. Moreover, corporate, from the latin corporare which means “form into a body,” which may also stand for our union as one. Our wedsite (munkybizniz.wordpress.com) had the tone of a company site, complete with corporate history and values, products and services, etc. I wrote the wedding invitations, which was patterned after a press release (all those years of doing PR writing rakets helped)! 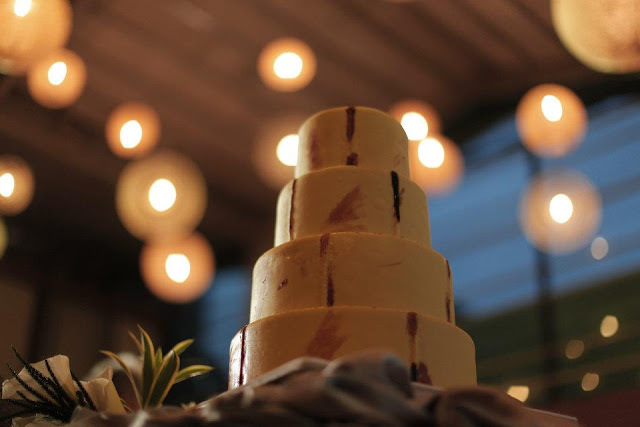 With the help of two art director friends, Coy Cueto and Marc de Vera, we developed all the design elements for the wedding. Coy did the logo of a Munky girl and boy while Marc did the invitations. 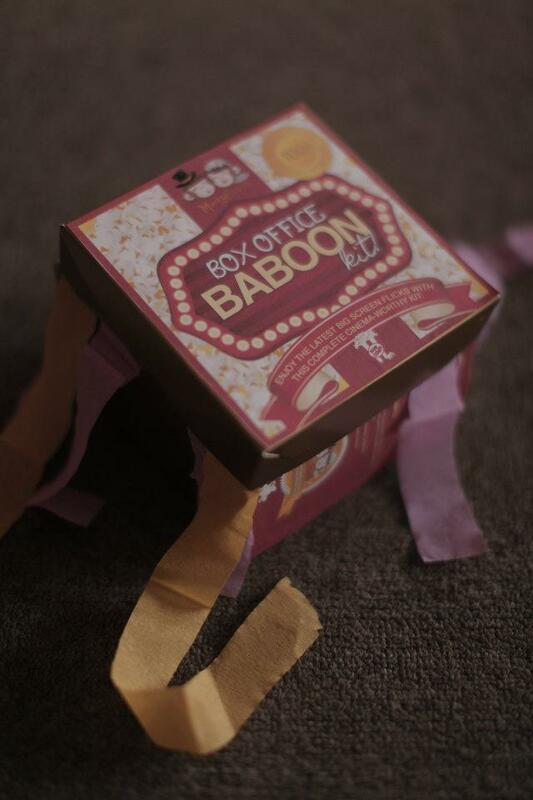 • Movie Buff Munky Kit – A set of two DVDs that Mark chose and grouped together. We are both big movie fans! • Macho Matsing Kit – Rambo DVD set + man essentials including Rogin-E vitamins, a shaver, hair gel and uhm, Sebo de Macho ointment for those battle scars. • Gorgeous Gorilla Kit – Assorted make-up in the wedding colors of yellow, purple and peach/orange. • Box Office Baboon Kit – Another movie-themed kit, inclusive of a pre-paid Ayala Cinema ticket, microwave popcorn and tissue—in case of tears. 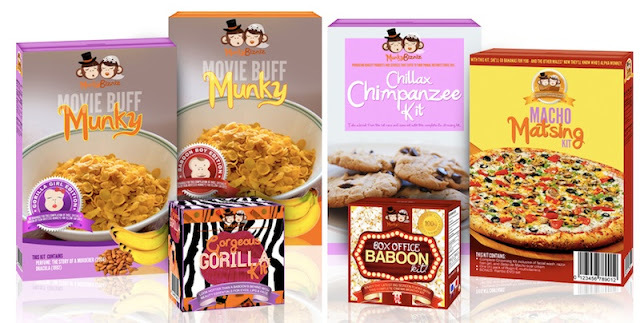 • Chillax Chimpanzee Kit – A relaxing kit inclusive of aromatherapy masks, body oil, calming lotion and massage cream. 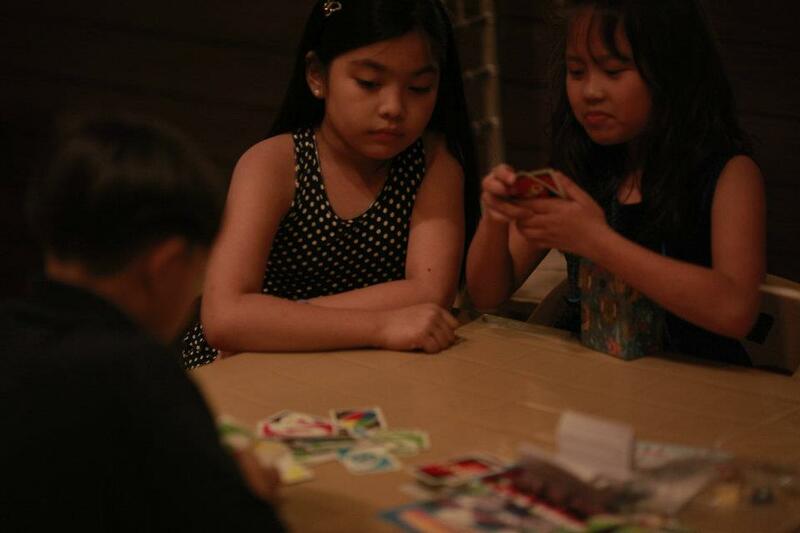 • Pin the Tale on the Munky – A trivia game about Mark and I, wherein guests answered by raising either the Munky girl or Munky boy logo. • Barrel of Munkys – The classic Barrel of Monkeys game. • Pass the Primate – The only couples game, wherein 2 groups—the husbands/boyfriends and the wives/girlfriends—had to pass around against monkey head or banana to the music of “Peanut Butter Jelly Time!” Like musical chairs, whoever ends up with the monkey/banana when the music stops, gets eliminated. • Movie Buff Munky- A movie trivia game based on our favorite films. To choose the 3 girl contestants and 3 guy contestants, we had a hilarious elimination round wherein Mark threw 3 angry bird heads for the girls to catch, and I chose 3 bouquets for the boys to grab. Needless to say we got the effect we wanted from the games---lots of stomach-rippin’ laughter. Even better, winners loved their prizes! We worked closely with our florists and suppliers in designing the details for the reception. Every table was named after famous monkeys in history. We had monkeys hanging from the lattice backdrop on the main stage. Our cake was designed like banana slices. And to keep the kids occupied, we turned one room in our venue, C3 events place, into a play area complete with coloring books, toys and of course, monkey hand puppets. Our parent friends were very thankful for the playroom as it kept tantrums under control by occupying the little ones occupied. 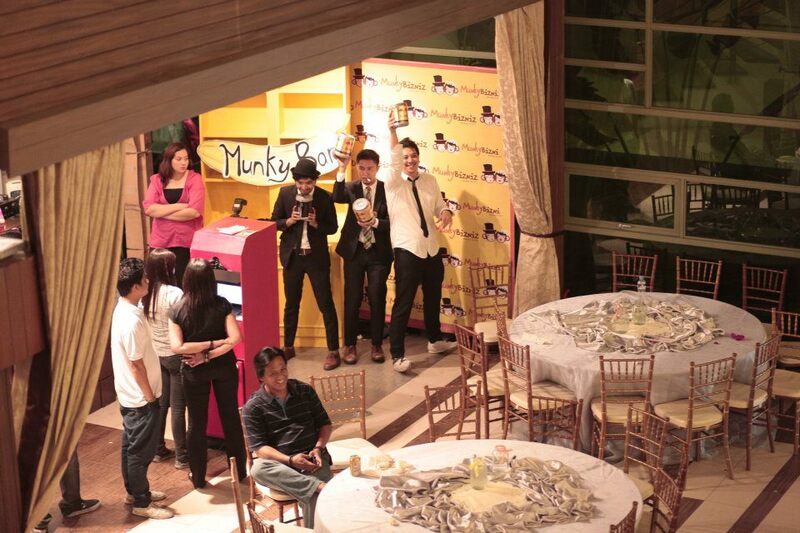 For our photo booth, which was sponsored by a client turned friend, we had a “Munky Bar” complete with oversized soda cans and Yakult bottles. 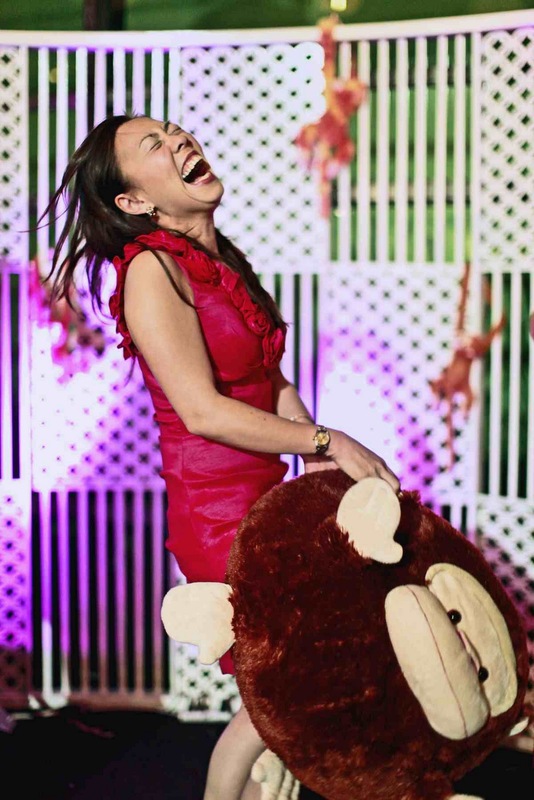 Our interior designer friend, Maruja Calixto, also helped by creating the Munky Bar logo. This is a tribute to the fact that Mark and I actually met during a photo exhibit that took place at a bar in Malate. 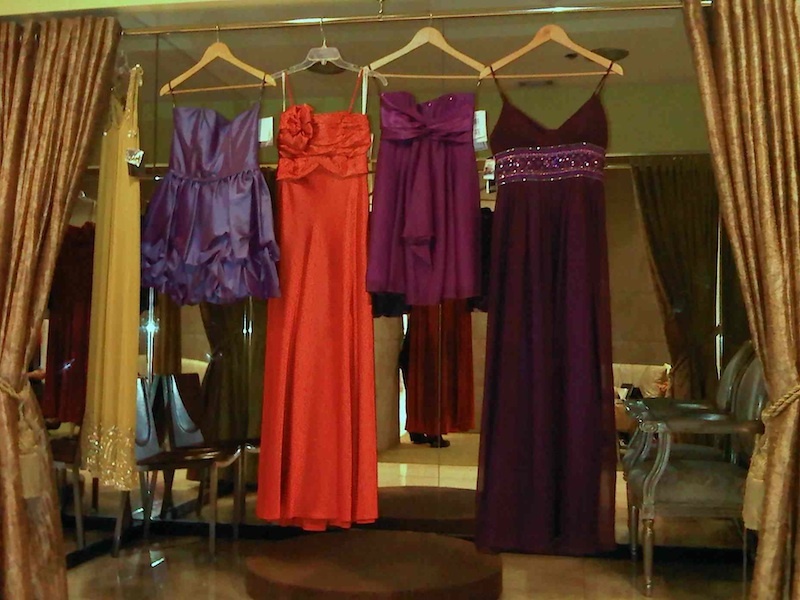 Finally, all the dresses including the bridesmaids’ gowns, flower girls’ dresses and bridal dress were purchased off the rack at the Rustan’s Gown Gallerie. We finally chose dresses in different shades of peach/orange and purple and various cuts to suit each girl’s body type. We did this because my friends and I like the idea of veering away from a cookie-cutter look. Besides, we always enjoy playing dress-up and taking pics of each other. The in-house alterer, Tess, adjusted the length for me. Since it dipped low in the back, I had to cover it with detachable beaded strings for the church, which Tess also made for me. It was fashioned out of beads, which I purchased at Divisoria at only P120 for half a kilo! 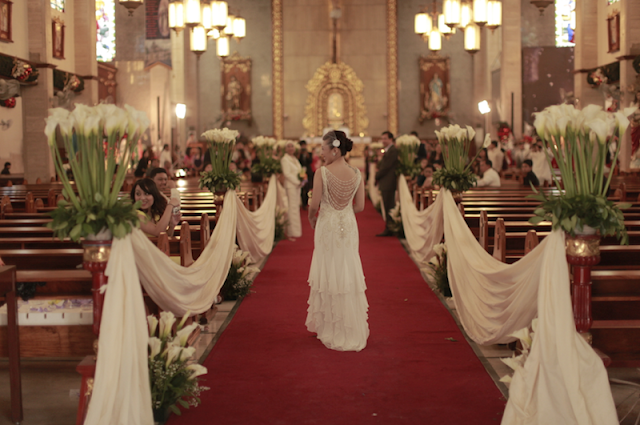 I originally wanted a traditional veil but at the suggestion of our make-up artist, Claire de Guzman and her hairstylist, Sonny Mar Roxas, a birdcage was recommended. I actually felt that a birdcage can get too trendy so I made sure that the two veils I had made were not overly detailed. For the church, I wore a simple white birdcage by Bonsai Fojas. Then for the reception, I changed into a slightly more detailed piece with beaded lace by Mikee Palmera. I was very comfortable in my dress as it had no binding corset nor a long train, which came in handy during the Greenhills Promenade photo shoot we did after the ceremony. During Christmas time, the traffic in the area is really bad! Our lead videographer, Iggy Bilbao of Cinematic Concepts and lead photog, Randall Dagooc of Mangored, both called me and asked if we were game to walk. So we did, in all our wedding finery! ODK. muntik na akong magbuga ng iced tea sa screen when i read the line: "Instead of saying “blue and white” or “shabby chic” we’d answer “unggoy!” EPIC! i literally laughed! great post! :) can't wait for part 2! 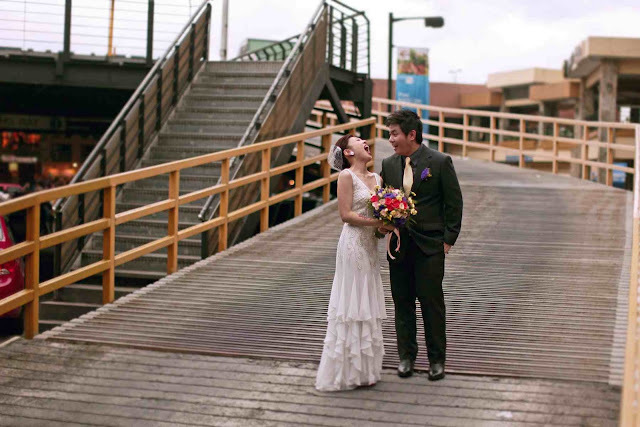 It's Techy Romantics' Ryan B. Villena's brother's wedding! :) Nice! Really beautiful. I love the concept.